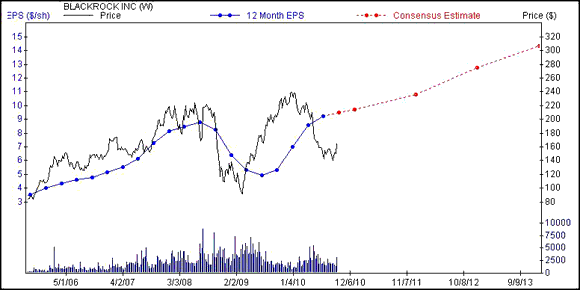 BlackRock Inc (BLK) has been able to right the ship following a difficult 2009. Analysts have been revising their estimates upward after the company nearly doubled revenue. BlackRock is one of the world’s largest investment management firms and is based in New York City. It recently became a Zacks #2 Rank (Buy) stock. BlackRock reported second quarter earnings per share of $2.37, beating the Zacks Consensus Estimate by 7 cents. Earnings per share grew 35% from the second quarter of 2009. Total revenue nearly doubled over the same period. Performance fee revenue increased 194% alone. Total expenses were up just 74% over the same period. As a result, operating income increased 145%. The operating margin improved from 34.4% of total revenue to 38.8%. Assets under management were $3.15 trillion at the end of the quarter, up from $1.37 trillion at the end of the second quarter in 2009. The increase is due in part to the acquisition of Barclays Global Investors in December 2009 and stronger financial markets. The Zacks Consensus Estimate for 2010 is $9.70, representing 36% annual growth. The 2011 estimate is 12% higher at $10.85. BlackRock is expected to grow earnings at 12.5% per year over the next five years. BlackRock is attractively priced at just 17.9x trailing earnings, a discount to the industry average of 21.1x. It also trades below book value at 0.9x, a discount to its peers at 1.3x. 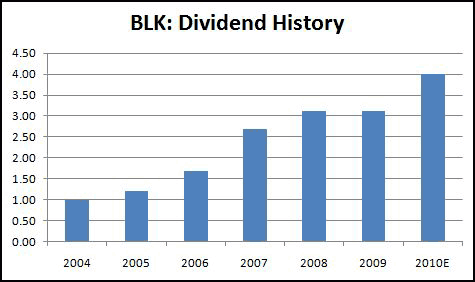 BlackRock has raised its dividend at a compound annual growth rate of 26% since 2003. It currently yields 2.4%.